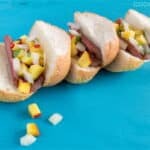 Your classic grilled hot dog just got better with 2 tasty hot dog toppings: Peach and Vidalia Onion Salsa and a Sweet Chili Mustard. Oh, and these hot dogs are sliders (so plan to eat more than one!). I developed this recipe for the Vidalia Onion Committee. It’s appearing on their bags of onions this summer. Let me know if you spot it in a store near you! The sun’s shining, there are shrieks and splashes coming from the pool and I know it’s time to put some hot dogs on the grill. Nothings says summer like grilled hot dogs. Except maybe a grilled hot dog topped with peach and Vidalia onion salsa. These hot dogs are seriously good. I do them as sliders for no other reason than that they’re cute. Oh, and because it lets me justify eating more than one. 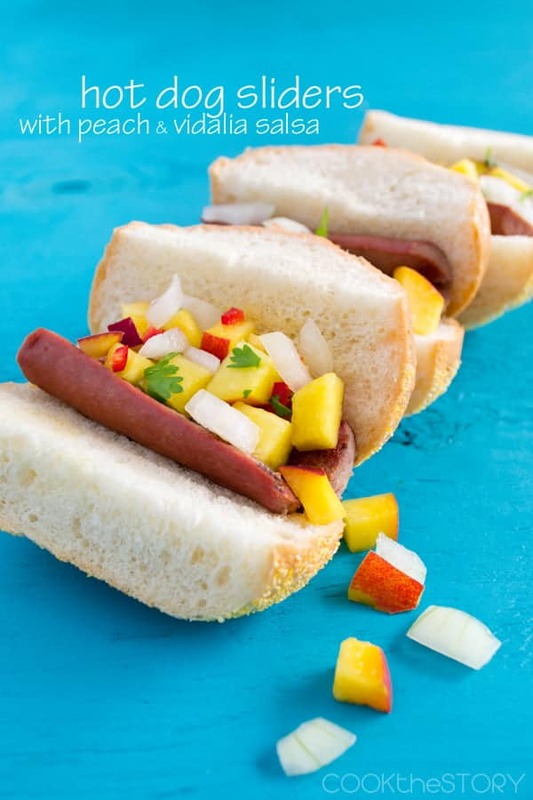 Make a quick hot dog topping out of peaches, Vidalia onions, red chili, lime and cilantro. Cut your weiners in half (so you have two mini-weiners where before you had only one) and grill them. While they’re grilling, you get ready to become Hot Dog Champion of the World by making another hot dog topping: mustard mixed with honey and chili powder. When the weiners are nearly done, split open some dinner rolls and spread on your honey mustard. Then top with weiners and the sunny salsa. You can do these as a platter finger-food-style appetizers to pass around or have them as dinner with a simple salad. Easy-breezy, bright and fresh summery food. Gotta love it! 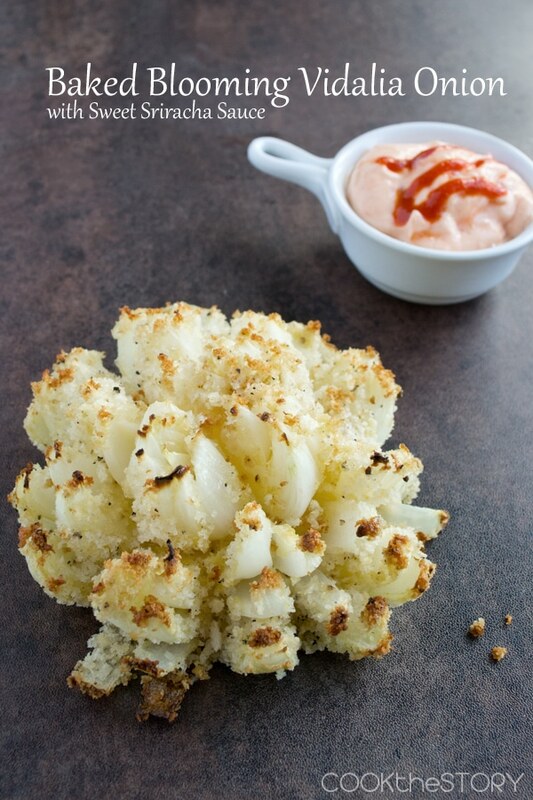 Oh, and if you want another delicious Vidalia onion appetizer to serve, be sure to also check out my baked blooming onion recipe. 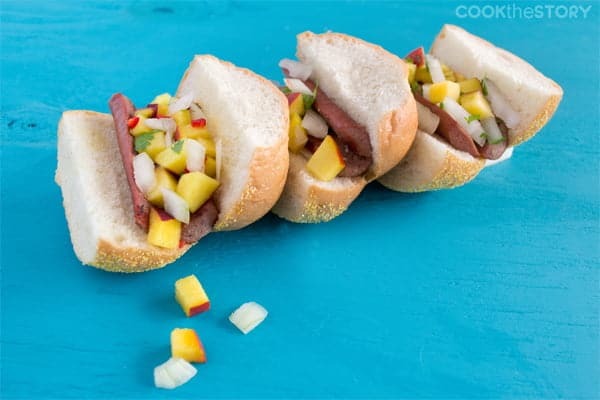 Your classic grilled hot dog just got better with 2 tasty hot dog toppings: Peach and Vidalia Onion Salsa and a Sweet Chili Mustard. Oh, and these hot dogs are sliders (so plan to eat more than one!). In a medium bowl combine Vidalia onion, peaches, chili pepper, lime juice and cilantro. Use a knife to split each wiener open lengthwise but do not cut all the way through. Cut each wiener in half widthwise to create 6 mini wieners. Grill wieners over direct heat, flipping occasionally, until browned and starting to blacken at the edges, 9-12 minutes. While wieners cook, make the mini hot dog buns: Set a dinner roll on a cutting board top-side-up. Cut it in half starting with knife on top of the bun and cutting down all the way through the bun. Lay each half cut-side-up and split through the middle, but do not cut all the way through, thus creating a mini split hot dog bun. Repeat with remaining buns. Spread each bun with 2 teaspoons of the mustard mixture. Top with a wiener, split side up. Fill the split in the wiener with the Vidalia Peach Salsa. Hey, I just read this list of hot dog toppings from Bon Appetit readers and I could never have guessed some of these. Do you put something unusual on your hot dog? Tell me about it in the comment section below. Wow, everything in this recipe sounds just right for my tastebud. Peaches and wieners is like a knockout matchup. By the way Christine, I made the pulled pork sliders last week, and oh they were such a hit in the family!